The 2017 gardening season is about to begin, and as we all contemplate our plans for next year’s garden, I thought it would be useful to discuss why gardening makes sense from a financial point of view. So much of gardening today seems to be about buying fertilizers, amendments and accoutrements, but I think that is mostly the result of very successful marketing efforts on the part of various business entities that stand to profit from such a mentality. If we look back to the past, gardening was a means to work with the soil to produce food, and it was completely worthwhile for anyone with access to land. 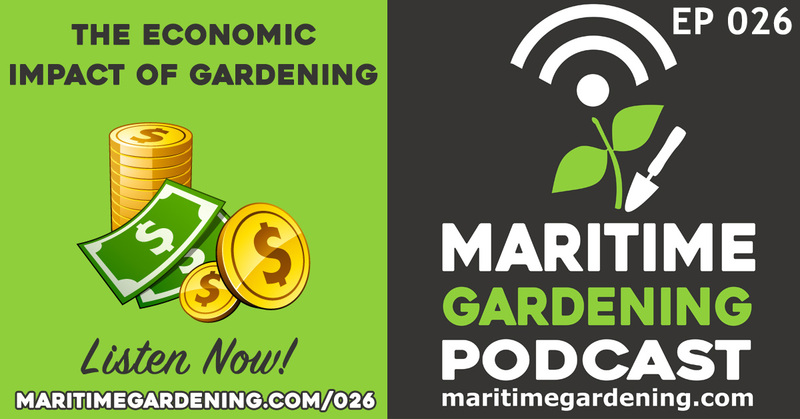 In this episode we will quantify how beneficial food gardening can be if you undertake the endeavour with the goal of a net gain. In the contemporary context, we think of investment vehicles in terms of a broad litany of exotic investment platforms such as stocks, bonds, mutual funds, guaranteed investment certificates, property holdings, etc. The many options can mystify the mind, and we buy in based on our faith that over the long run, our prudence will result in long-term returns that take advantage of compound interest, macro-economic factors, and of course luck depending on how much risk we are willing to take in making these investments. Long story short, and at the risk of over simplification, at best we can expect a maximum of 7% to 10% return in a good year, and negative returns in bad years. Let us contrast this conception of a good investment with what is perhaps the oldest known form of investment known – agriculture. A pack of seeds costs from $1.99 to 2.99, and that can easily fill a 4′ X10′ garden bed, or even more depending on the variety and how judicious you are with your seeds. If we use kale as an example, planted in in May – by June you will have enough kale to feed a family of four a mess of kale at least twice a week – and because kale can be harvested multiple times, those same plants will provide well into October, or possibly November depending on the variety and growing conditions. If we work that out such that we assume the equivalent of two heads of kale a week for 5 months, at $2.99 a head (the typical cost of that amount of produce at a grocery store), that’s about a $200 value per year in produce , a 6589% return in a single year based on a 2.99 pack of seeds. I sincerely doubt that the stock tip of the century could possibly yield such results. Example 1: A household that spends $60 a week (yellow line) will save $1440/year on produce, such that those savings will accumulate to $7,200 after five years. Example 2: A household that spends $40 on produce a week (grey line) will save $960/year on groceries, such that those savings will accumulate to $4,800 after five years. Example 3: A household that spends $20 on produce a week (orange line) will save $480/year on groceries, such that those savings will accumulate to $2,400 after five years. Of course there is a time cost, and some might argue that the value of that time is equal to or greater to the value that can be realized from the garden produce, but I would suggest that this view is myopic, and does not take into account the holistic benefits of gardening. Imagine a gym membership that costs nothing, provides highly beneficial stress relief, and sends you home with a bag of groceries every day. No such gym exists – but a backyard garden provides all of those benefits and more, as there is no driving or parking involved. In addition, maintaining a garden gets you outside every day, in the fresh air with the sun and birds and it just has a profound and wonderful effect on your mental health, and overall state of mind. There is also the health benefits of a plant based diet. When you have a backyard garden, when the vegetables are producing in full swing, you often find yourself re-organizing your household diet, literally gorging on your produce just to keep up with the production. The side effect of this is weight loss, added vitamins and minerals, and just feeling great. In this age of market uncertainty, it’s nice to know that there are low risk, high return options available. All that is required is to think outside the box, broaden your definition of what an investment is, and try a different strategy. Look back to the past and reacquaint yourself with the soil. Over time you will find that there is no investment that comes close to the kinds of returns that well planned gardens can offer. Given that gardening gets easier as you get better at it, especially when using a permaculture approach, this means that every year, your garden will produce more with less work, and that’s money in the bank. One of the best podcasts yet. Self sufficiency is a good feeling. An even better feeling though is when you have enough to gift to others. Just get growing !